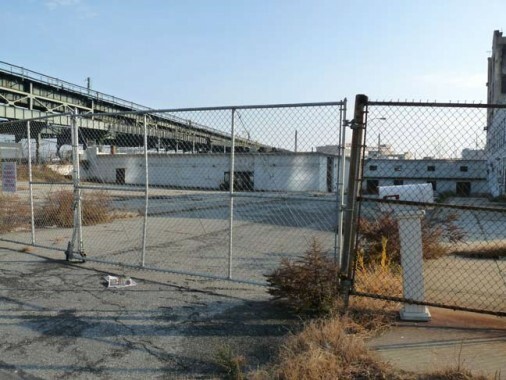 Just as I wrote about the odd lost streets of Greenpoint in December 2012, many or all of which never existed in the first place, I also explored the usually unremarked-upon dead ends of Hunters Point, just across the mighty Newtown Creek. These streets are lined up along Jackson Avenue between its source at Vernon Boulevard all the way to the el train maze at Queens Plaza. 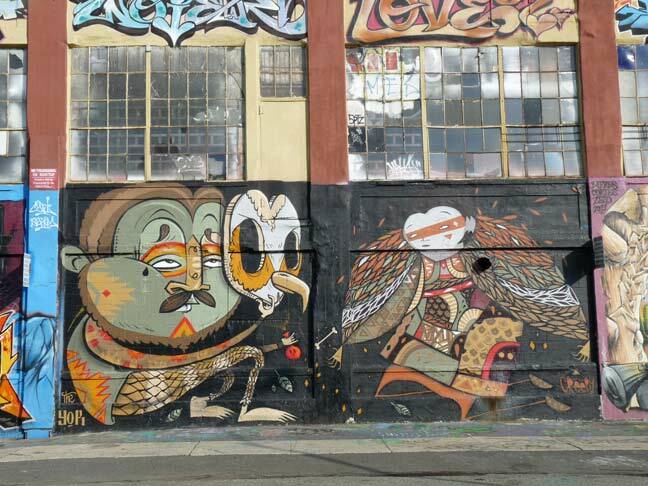 Before expounding on the alleys themselves, each of which presents a different face from the other, I’ll relate a little information on Hunters Point as well as the streets’ origins. Dominie’s Hoek (Hook), originally the western end of the town of Newtown, was originally settled when a tract of land was awarded to Everard Bogardus, a Dutch Reformed minister (dominie), in 1643. The land was later owned by British sea captain George Hunter and by 1825 had become known as Hunter’s Point. It began the transition from rural farmland in the 1860s when the Long Island Rail Road built a terminal that would be its primary connection with Manhattan until the East River tunnels and Pennsylvania Station were built in 1910. 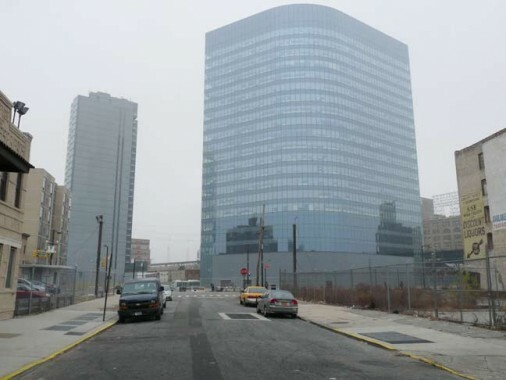 In 1852, President Eliphalet Nott of Union College, then the owner of Hunter’s Point, went into business with Jonathan Crane and Charles Ely to develop the Hunter’s Point area as a real estate venture. 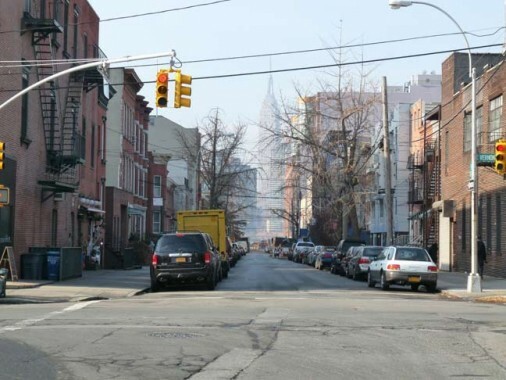 Within the same year, the partners began to grade and level out the area and began to stake out the first streets. 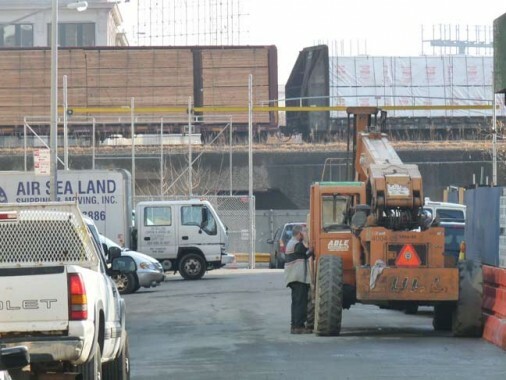 The area was surveyed and mapped, and lots began to be sold. The map, dated May 16, 1854, was the foundation map for the new village of Hunter’s Point. It shows 16 blocks of the former Hunter farm laid out in 25-by-100-foot lots, and the new streets, 1st through 10th Streets, corresponding to the present streets of 54th Avenue to 46th Avenue. The shoreline was just west of the current 5th Street at that time. Between 1853 and 1861, substantial progress was made in creating the town of Hunter’s Point. Streets were laid out, buildings were erected, and a ferry service to Manhattan was begun. 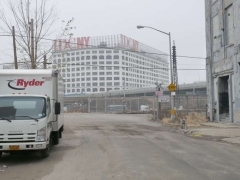 With ample available land, few existing residences, and excellent barge access via the East River and Newtown Creek, industries, eventually including railroad yards, oil and kerosene producers, and paint and varnish manufacturers, began to move to the Hunter’s Point area. New rail service on the Long Island Rail Road (LIRR) in 1861 and the outbreak of the Civil War brought many changes to the area. 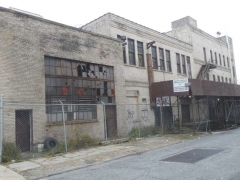 The rail company filled in 10 acres (the first known landfill out to what is now 2nd Street) and built car houses, engine houses, machine shops, and a depot. The Civil War created a huge demand for lumber, oil, and iron wares, and heavy industry began to dominate the waterfront. This is a section of an 1873 Beers atlas of Long Island City. Note the number of diagonal streets proceeding east from Jackson Avenue. They cross what was then the Flushing and North Side Railroad, which was incorporated into the vast Sunnyside Yards built between 1900-1910 in advance of the railroad’s entry into Manhattan’s Penn Station via East River tunnels, and end in marshy land surrounding Dutch Kills and its tributaries. 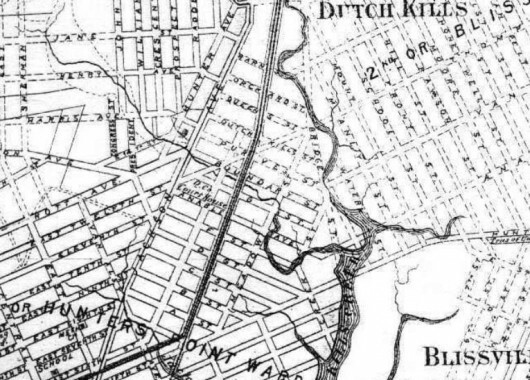 The Kills has since been dredged and tamed into a channel, and landfill has shored up was used to be marshland so the streets of Sunnyside, shown here by hopeful dotted lines on the map, could be built. These short streets were originally named for letters from A to G, with the exception of Anable Avenue which stood in for F. North of that, the streets have retained their names as shown here, with one exception. 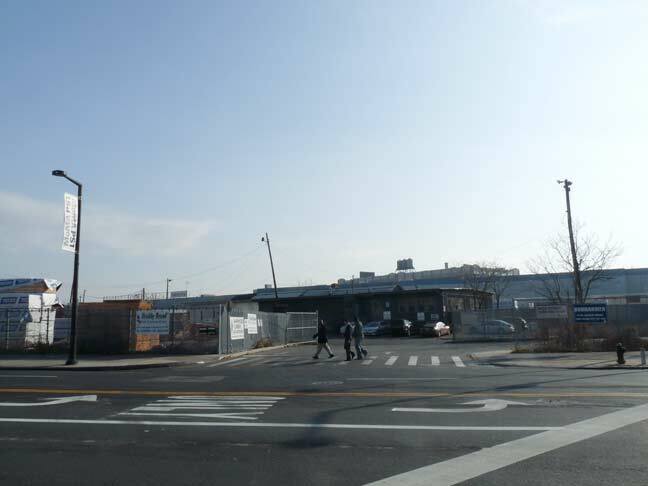 Jackson Avenue begins an almost 100-mile run at Vernon Boulevard just north of Borden Avenue and the west end of the LIRR Queens yards. 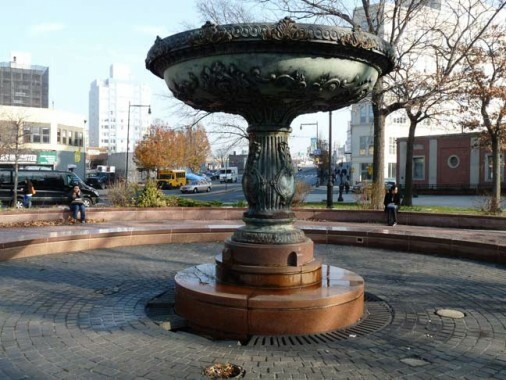 It was built as a toll road by John Jackson in the 1850s and followed Indian trails east of what would be Flushing Meadows-Corona Park as Broadway, the North Hempstead Turnpike, and other names. 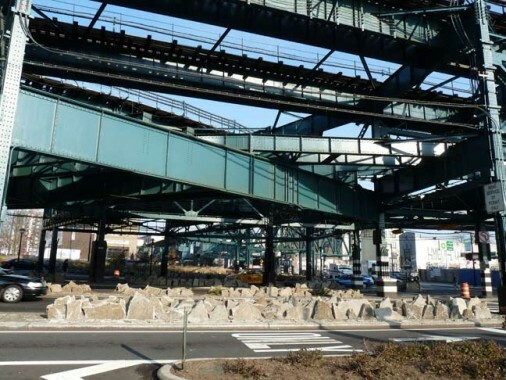 By the 1890s the tolls were removed and by 1920, the road was called Northern Boulevard from Queens Plaza east to the city line in Little Neck. In subsequent years, the name Northern Boulevard has taken over for North Hempstead Turnpike in Nassau County, while the entire road incorporating older roads in Nassau and Suffolk, is NYS 25A out to Calverton, NY, where it merges with NYS 25 and runs to the tip of Long Island at Orient Point. 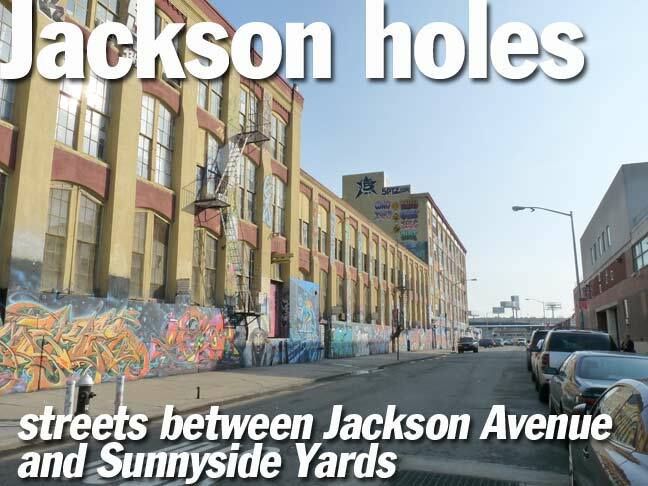 West of Queens Plaza, the road is still called Jackson Avenue. …while looking northeast on Jackson Avenue, the King of all Queens Buildings, the Citigroup Tower, dominates the skyline. 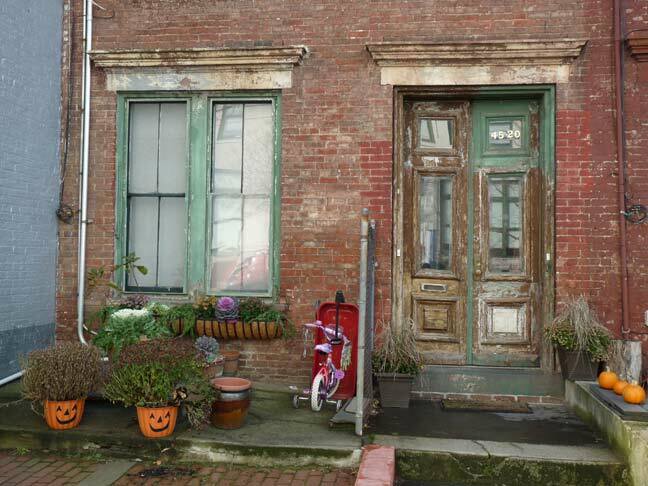 Walking up Jackson Avenue, the group of alleys we’re discussing today begins ast of 21st Street. This map of western Queens was made in 1909, a year before Sunnyside Yards officially opened, but it was largely completed by then. 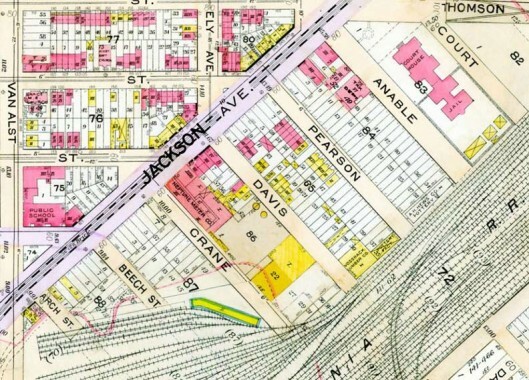 By 1909, we see that the alphabetical streets have been given names and the names are still in alphabetical order from A to D. A clue that there was once just a double-tracked railroad here, and not a vast yard, is that Davis and Pearson Streets have corresponding streets named Davis and Pearson on the other side of the tracks in Sunnyside. 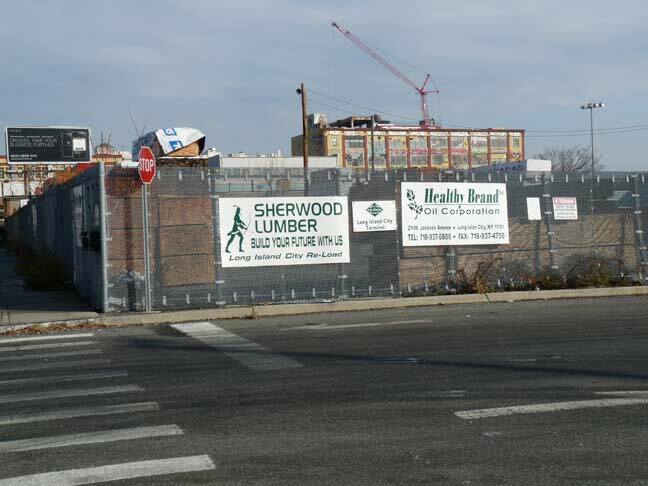 Van Alst and Ely Avenues will be recognizable from subway signage, as they are now 21st and 23rd Streets. 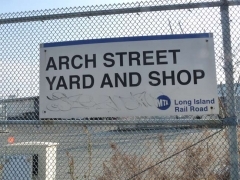 Just about all of Arch Street has been obliterated, but the Jackson Avenue intersection has now been turned into a busy entrance to the LIRR Arch Street Yards, built in 2005. 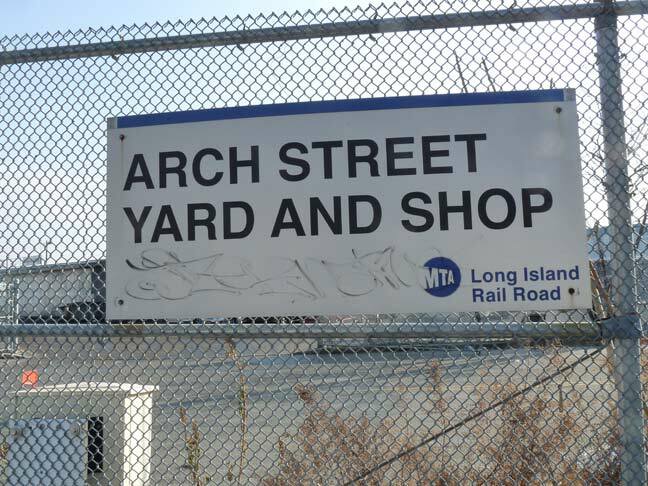 Beech Street no longer exists in any form; it used to be an opening into the Arch Street Yard, but no longer. Curb cuts do show its former location. 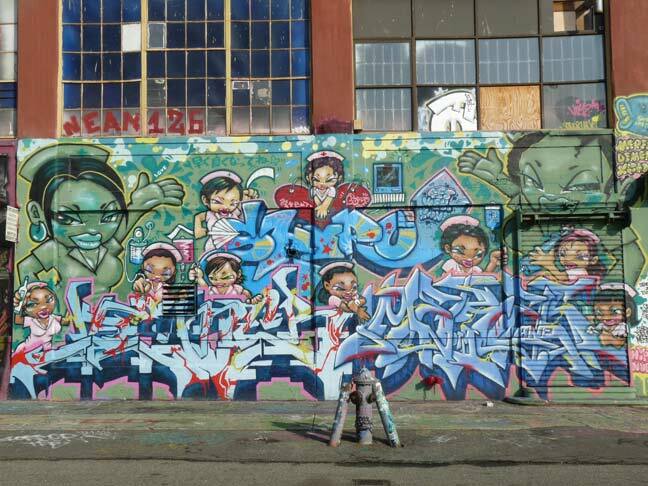 Crane Street today is the most colorful of any of the “Jackson Holes”, because since the early 1990s it has bordered the 5 Pointz graffiti collective. 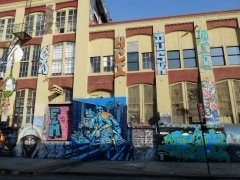 5 Pointz, originally the Phun Phactory in the old Neptune Motor Meter Building (see map above), is an exhibit space on Jackson Avenue and Crane Street in which graffiti artists have decorated the exterior of a 200,000 square foot factory building. 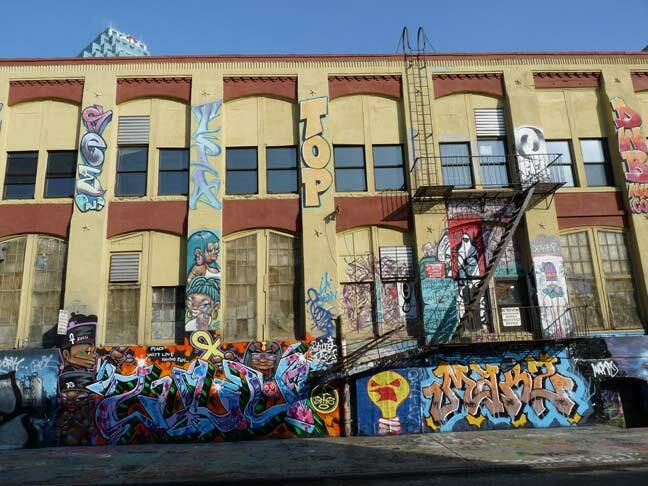 Artists pay below market rate rent for studio space in the interior. Pat DiLillo established Phun Phactory in the early 1990s to provided street artists a way of displaying their talents without breaking the law. 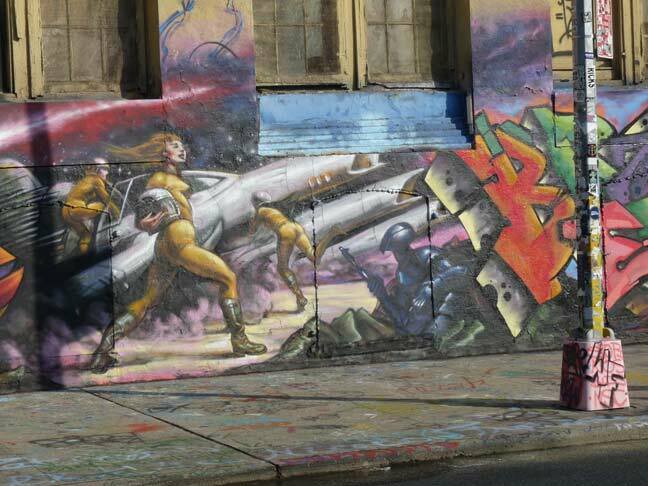 However, some artists argue that anarchy is a part of graffiti culture, and a legal space circumvents that mission. 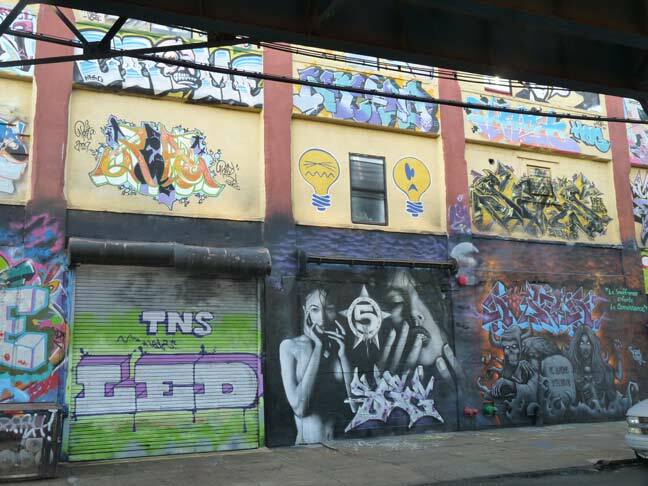 5 Pointz is most visible to the public on the #7 el, which runs behind the building. 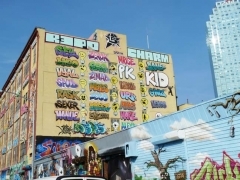 5 Pointz’ longtime owner, the Wolkoff family, had apparently decided in late 2012 to raze the building in favor of building rental properties, so stay tuned on its fate. 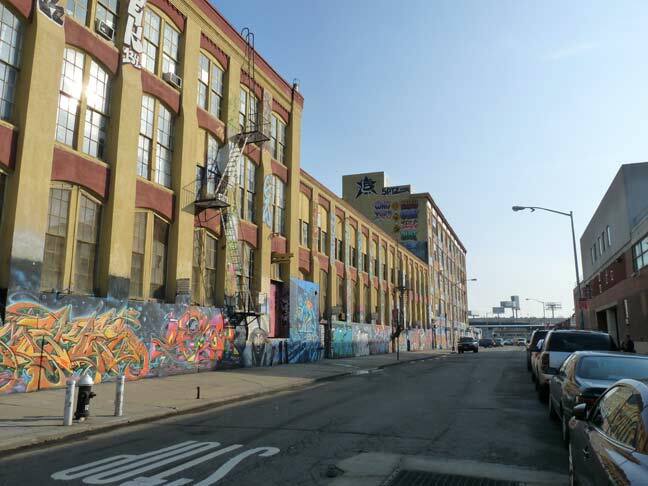 A short cut between Crane and Davis Streets is the parking lot behind 5 Pointz. The IRT Flushing Line elevated tracks are seen in the distance. After two stops underground the el rises in Sunnyside Yards are runs out to Flushing, where it dives underground again to its terminal at Main Street. 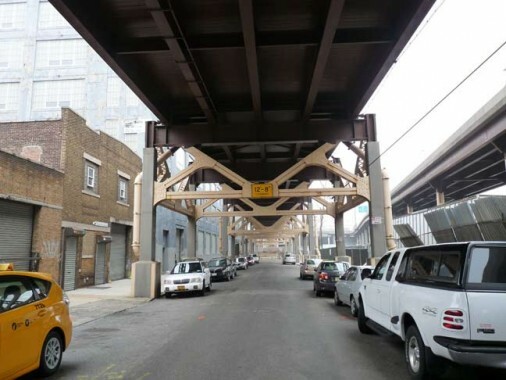 Davis Street is one of the few streets in NYC entirely covered by an elevated train (Livonia Avenue in Brooklyn is another). 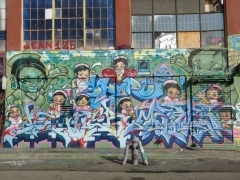 It is as colorful as Crane Street as 5 Pointz artists have decorated the east side of the factory and other buildings along the street. 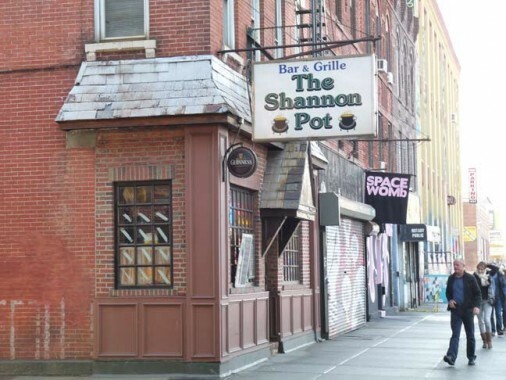 The Shannon Pot tavern at Davis Street and Jackson Avenue takes its name from the traditional source of the River Shannon in County Cavan, Ireland. It has been used for interior and exterior photography for Law & Order, Third Watch and Person of Interest. 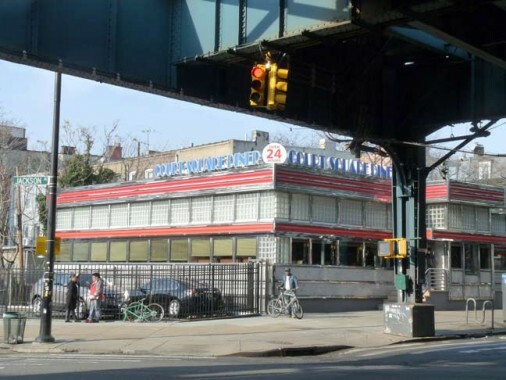 Court Square Diner, Jackson Avenue and 23rd Street opposite Davis Street. It has been here since 1955. I have resisted it since a few years ago when I got violently ill a few hours after a meal here, but don’t let me stop you. This is the multimillion-dollar escalator connection the MTA constructed that connects the G train, which terminates here at Court Square, to the #7 Flushing elevated line. The G had already been connected to the IND Queens Boulevard Line (E and M trains) via the system’s only people-mover. 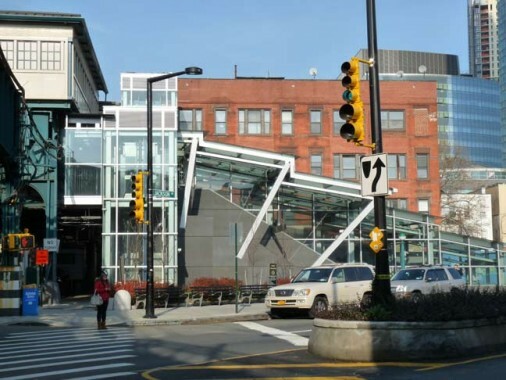 This connection took about three years to build and is eminetly convenient, but since the MTA cancels #7 service here frequently on weekends, its convenience is limited. 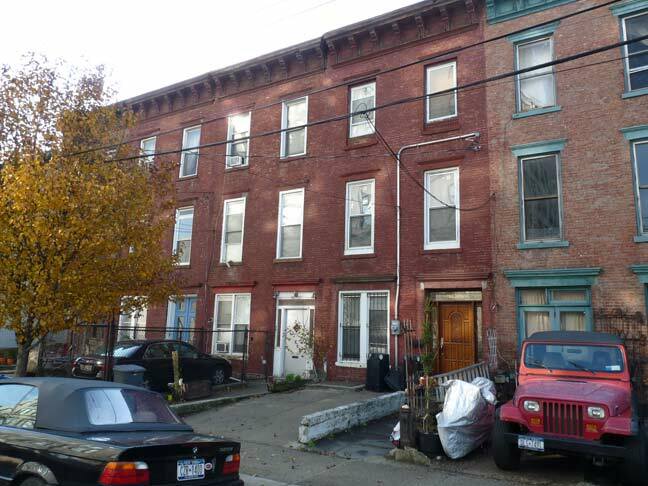 Pearson Street is one of the few of the “Jackson Holes” to feature mostly residential buildings: a few frame buildings, and a handsome row of attached brick buildings of considerable age. 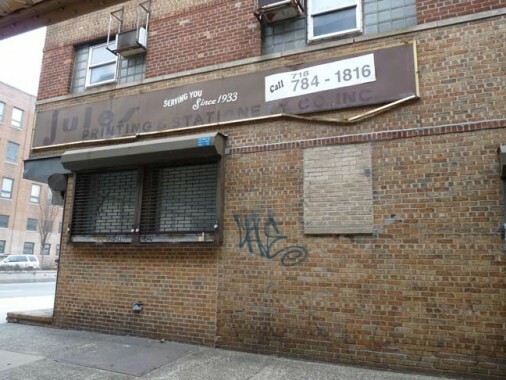 In fact they should be considered for landmark status as the 45th Avenue Hunterspoint Landmarks District was. A few of them still have their original door and window treatments. A freight train passes through Sunnyside Yards at the south end of Pearson Street. 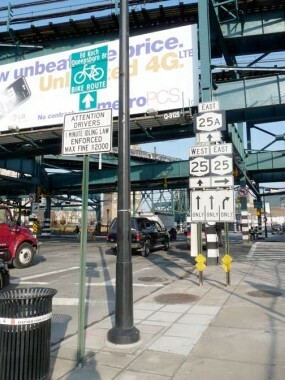 Between 23rd Street and Queens Plaza, Jackson Avenue has been given a flock of new black L-shaped Alliance lampposts, so-called because they were designed by Manhattan’s Downtown Alliance organization and originally appeared on Broadway between the Battery and City Hall in the early 2000s. The Alliance posts now run down Jackson Avenue and on either side of Queens Plaza. Court Square is wider than its fellow Jackson Holes, and of course is so named because it adjoins the 1908 New York State Supreme Court (below). 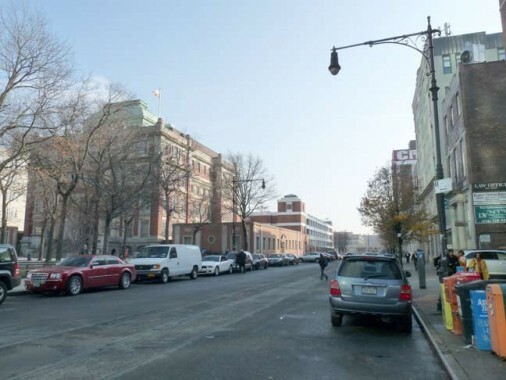 Its former name is Anable Avenue, named for Henry S. Anable, the son-in -law of Eliphalet Nott, the developer of Hunters Point and dredger of Anable Basin, a created inlet of the East River at 5th Street and 46th Avenue. Nott uncovered a mastodon bone during the process. 44th Drive’s former name is Nott Avenue. 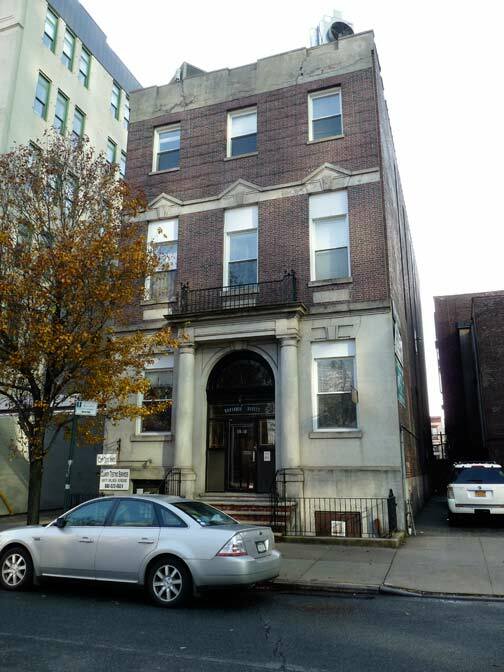 Outside this handsome 3-story brick building on Court Square with entrance Ionic pilasters, an attorney has hung a shingle. 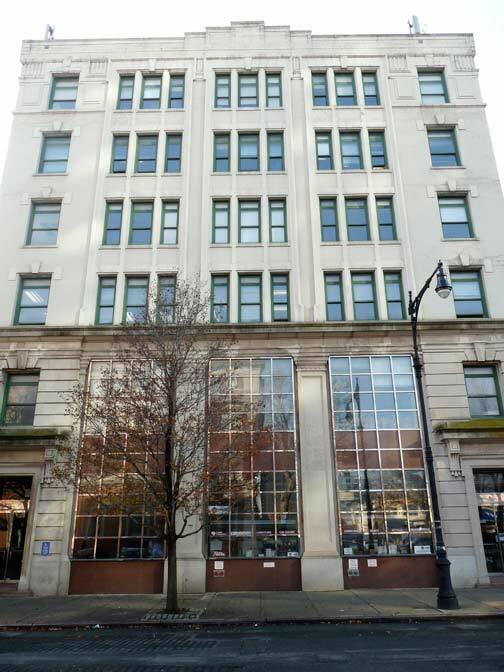 This 6-story Court Square office building extends back to Pearson Street. 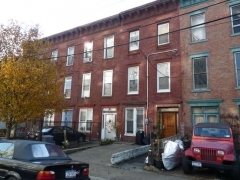 Well-maintained 5-story apartment building on the west side of Court Square. 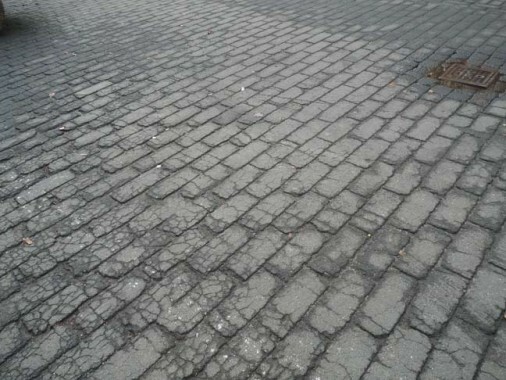 Some flat paving bricks have been left in place on Court Square. These are evener than the more common Belgian blocks. 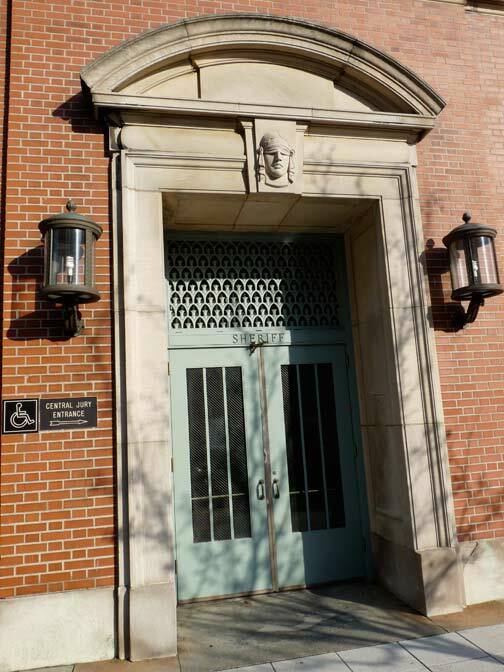 Jury members enter the courthouse through this side entrance in an auxiliary building. Note the blindfolded head of Justice above the door. 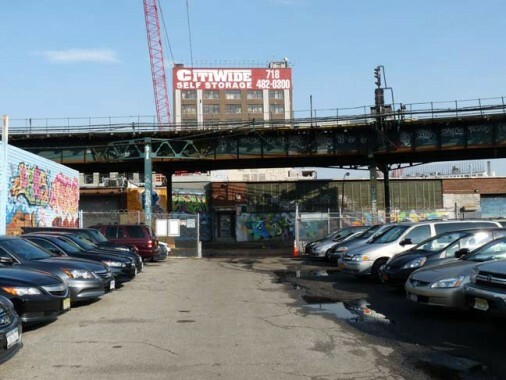 Parking garage at the south end of Court Square at its dead end at the Sunnyside Yards. I rarely see a decent-looking parking garage but this is one of them. 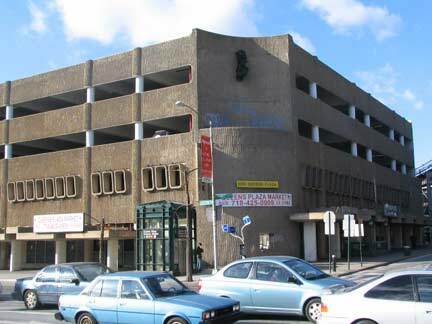 The parking garage behind the courthouse is where the old Queens House of Detention was located, the old brick at the entrance is part of the oiginal structure. A nice cinema reference to this building, the courthouse, the lawyers’ building across the street and the Court Sq elevated station can be found in Alfred Hitchcock’s “The Wrong Man” starring Henry Fonda as a musician accused of murder. 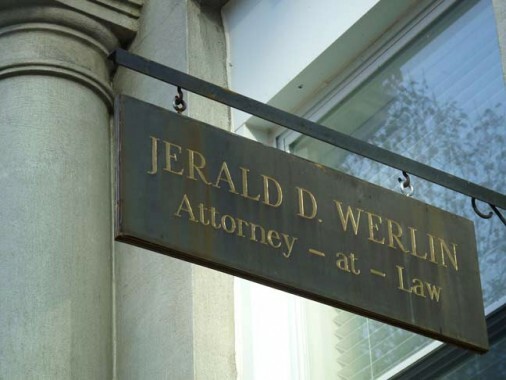 All of the scenes of his arrest, court arraingment and incarceration, plus his meetings with his lawyer and background plate footage were shot in the area between 23/Ely and the Courthouse. The former Queens County Court House (now home to the Queens Supreme Court) has been in this location since 1870, and sparked a political dispute that led to the creation of Nassau County. Long Island counties, beginning in the late 1600s, were Kings, Queens, and Suffolk. 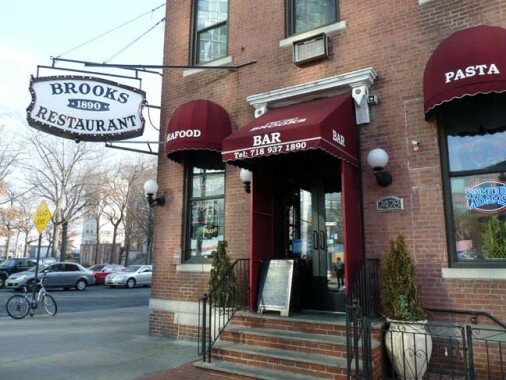 Six towns in Kings consolidated in the late 1800s to create the City of Brooklyn, which was annexed (residents voted to consolidate it) to Greater NYC in 1898. Queens’ history is a bit more complicated. 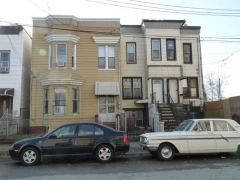 Queens originally comprised western Queens (the towns of Newtown, Flushing, Jamaica and in 1870, Long Island City) and what is now Nassau (Hempstead and Oyster Bay; North Hempstead was created in 1784). 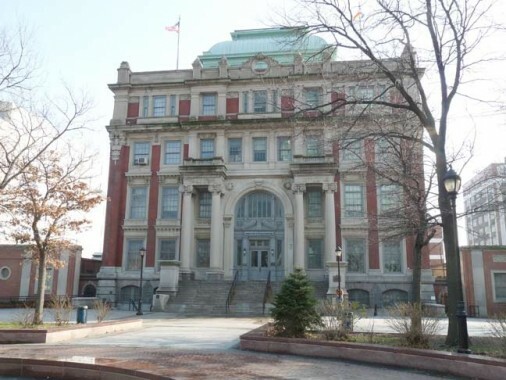 The eastern towns began agitating for “independence” from Queens County beginning in the 1830s, when a dilapidated courthouse in the Mineola area was to be replaced. 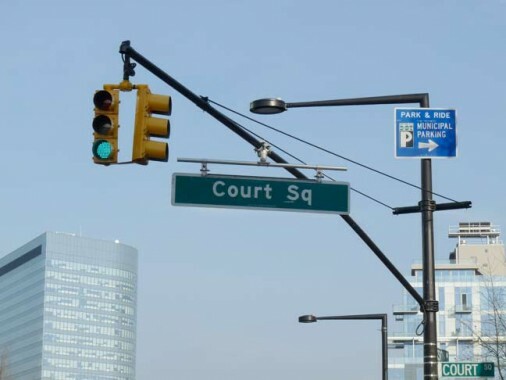 Factions from the western and eastern parts of Queens vied for the new courthouse, which was ultimately built in Long Island City at the present Court Square in 1870. Differences, political and cultural, between the east and west ends of the vast county were accentuated during the debate. In the 1890s, proposals for Greater New York did not include Queens’ eastern towns. When Greater New York was born on January 1, 1898, Queens’ four western towns were politically dissolved and western Queens became a borough. Queens’ 3 eastern towns remained extant. For one year, January 1, 1898-January 1, 1899, half of Queens County was in NYC, half was not. The eastern towns finally seceded to become Nassau County on 1/1/99. The first courthouse in this location burned down in 1904, and was replaced with the current Beaux Arts limestone structure in 1908 by architect Peter Coco. 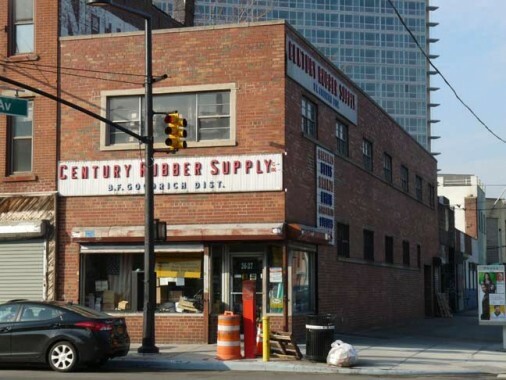 The famed 1925 murder trial of Ruth Synder (the smuggled photo of Snyder in the electric chair was a Daily News sensation in 1925) and the robbery trial of Willie Sutton, who robbed banks because ‘that’s where the money is’ were held here. Coco was indicted on corruption charges a year after the new courthouse opened, and was tried and convicted in the very courthouse he designed. Unfortunately, I know nothing about the venerable fountain outside the court house. 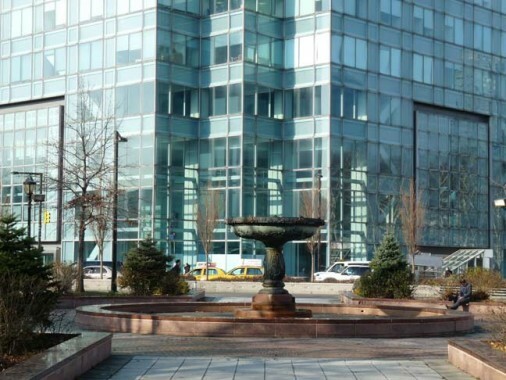 The internet is silent on it, and online information is spotty about fountains around town. Rising behind it is the sea-green, 45-story Citigroup (its latest name) Tower, completed in 1989. 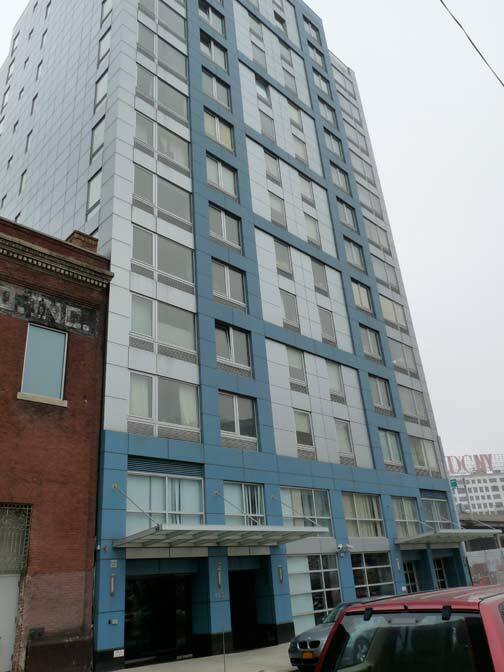 The building, designed by Raul de Armas of Skidmore, Owings & Merrill, is handsome, even omewhat refined; its pale blue-green glass and transparent windows are obviously intended to reduce the impact of the vast tower on Long Island City, and to a considerable extent they succeed. Thomson Avenue curves to meet Jackson Avenue at a right angle. 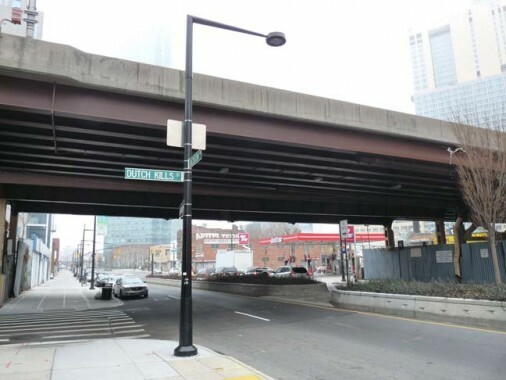 This is a relatively new engineering by the DOT, as it formerly met Jackson at an angle. 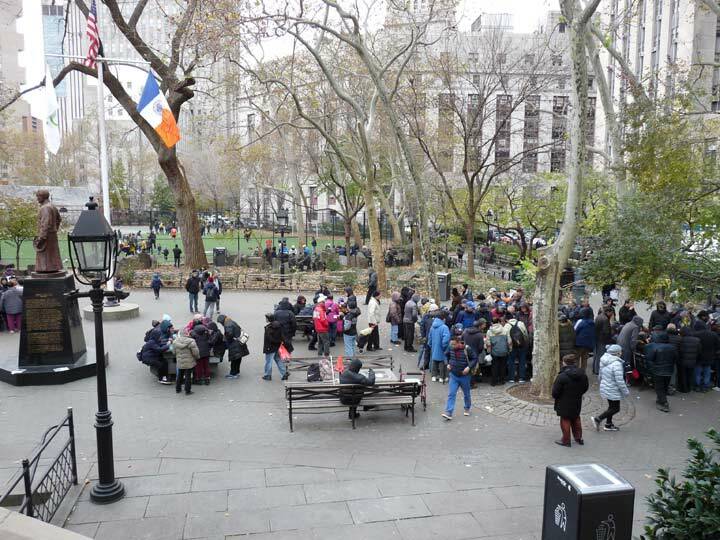 The old space is now filled by the park in front of the courthouse. The short piece of 44th Drive between Thomson and Jackson was long ago called Boundary Street. 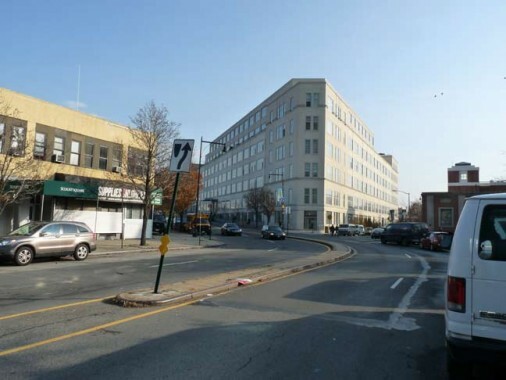 Thomson Avenue once extended as far as where Queens Center is now (east of that was Hoffman Boulevard), but when Queens Boulevard was built in the early 1910s it took over Thomson Avenue’s route, as well as Hoffman’s. 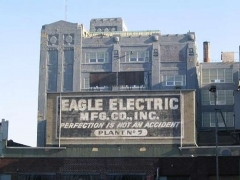 The large building in the background was formerly owned by Eagle Electric, but was converted to residences beginning in 2005. 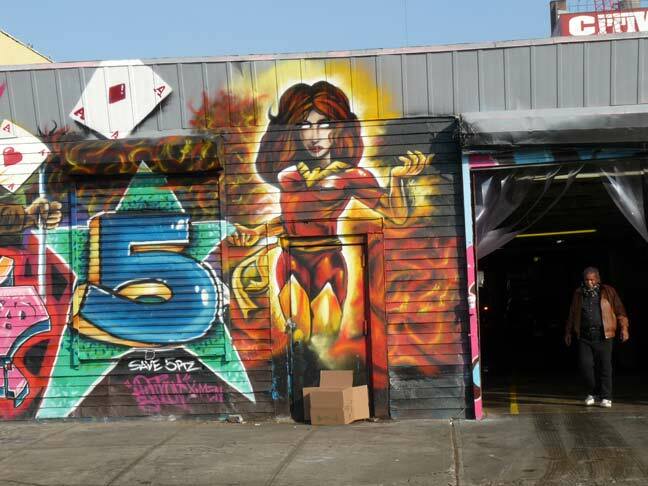 East of Thomson, what may well have been a former garage has become the Burger Garage. 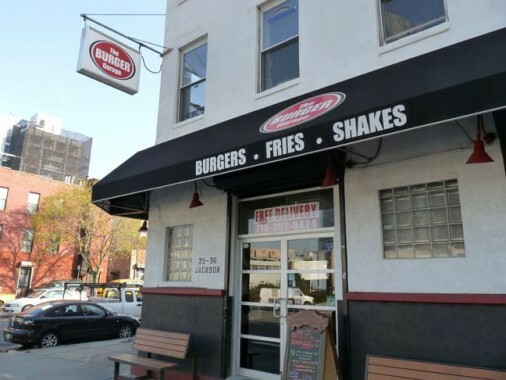 Despite the pleas of doctors and vegetarians, burger joints have been popping up all over town of late. I’ll have to try this place if I can ever get my teeth in order. On this map the orientation is northeast along Jackson Avenue. 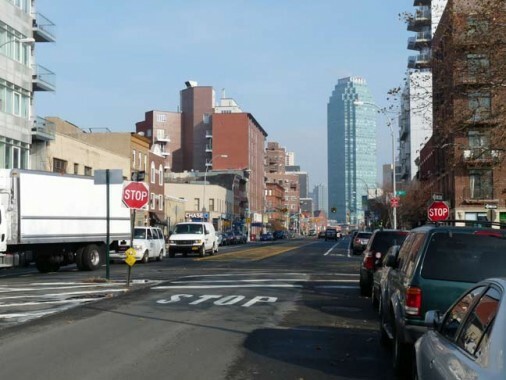 Henry Street is now 42nd Road and Jane Street became Queens Plaza South. 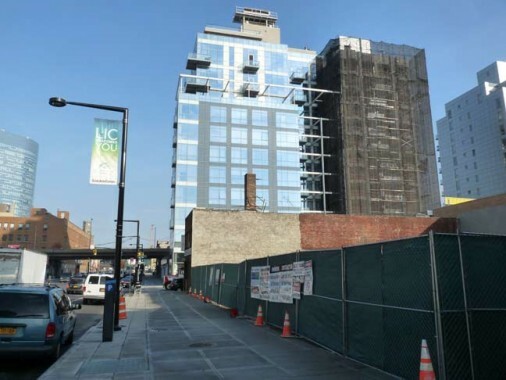 The SE corner of Purves Street and Jackson Avenue is dominated by the new Vere26 residential tower by controversial architect Robert Scarano, who has raised the ire of some bloggers by building noncontextual buildings, but don’t they all do that? 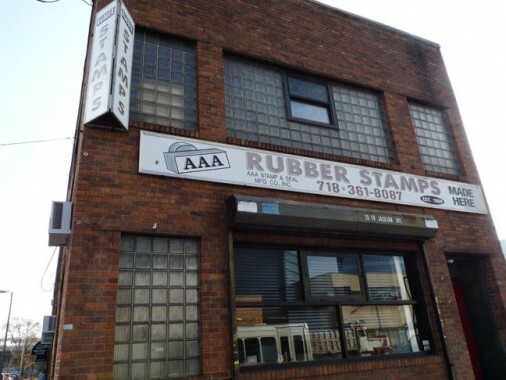 At Purves Street, Jackson Avenue and 43rd Avenue, two rubber suppliers stare across the avenue at each other, beady-eyed. 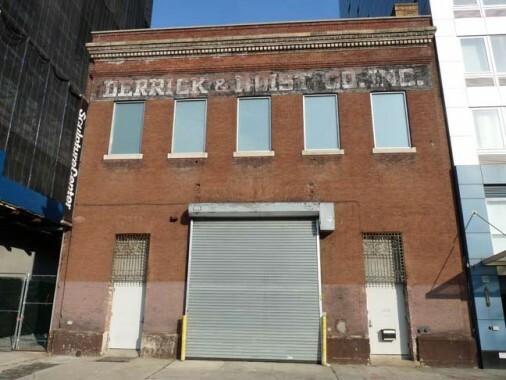 The old Derrick & Hoist Co. building on Purves Street is now home to the Sculpture Center. 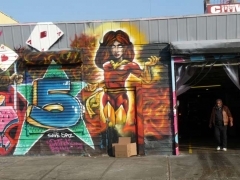 According to its website, this is a former trolley repair shop. 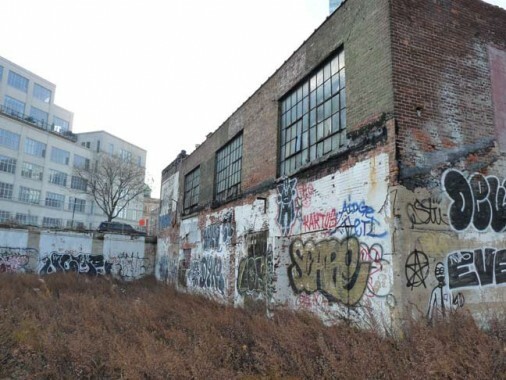 …is of a weed-choked empty lot, ringed by graffitied walls. 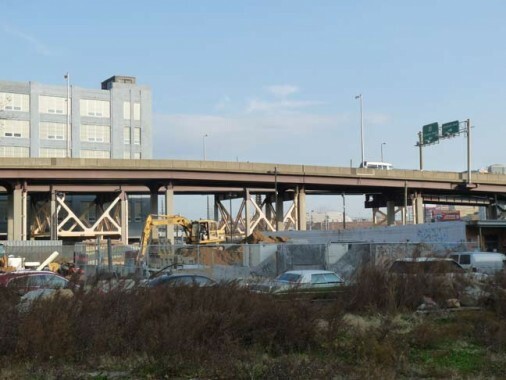 Next to 44-27 is a view of an on-ramp of the Queensboro Bridge. 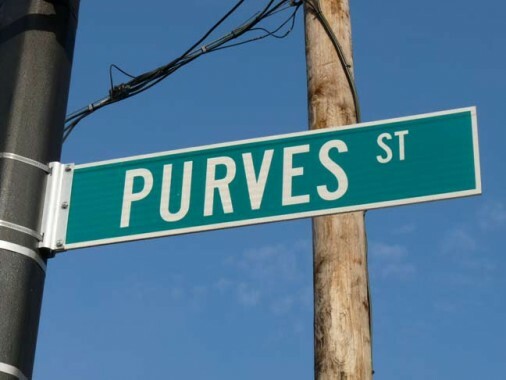 The Purves Street sign on this pole is unusual. While most NYC green and white signs have two white lines at the top and bottom, this one has a thin white box surrounding the green field. 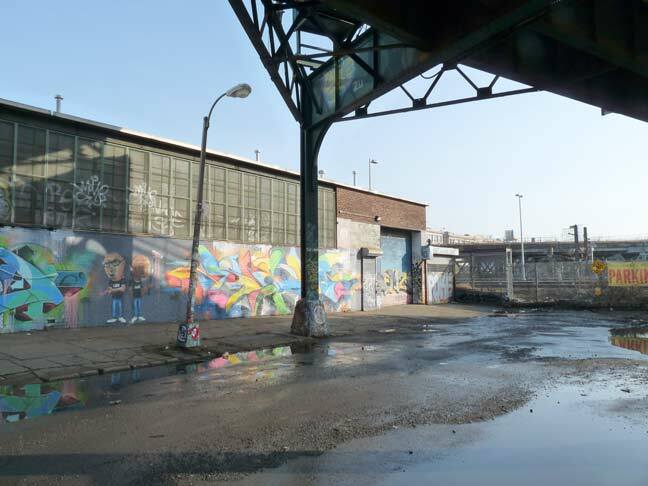 We are now actually in a subneighborhood of Hunters Point called Dutch Kills, named for the tributary of Newtown Creek that now, enclosed in a channel, flows to a dead end at 47th Avenue and 29th Street, south of Sunnyside Yards. 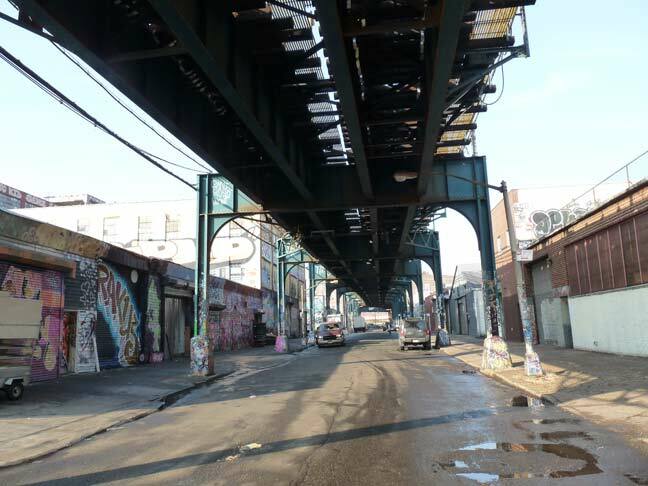 Like Davis Street, Dutch Kills Street is completely shadowed by an overpass, in this case the on and off ramp viaducts to and from the Queensboro Bridge. 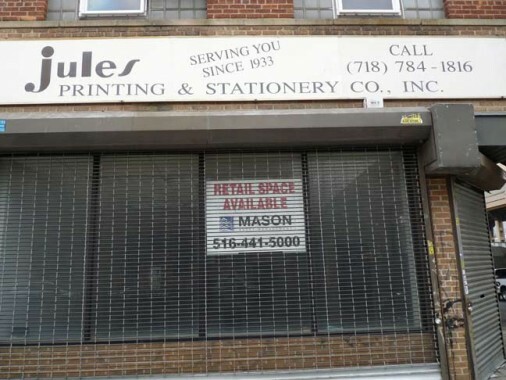 Jules Printing and Stationery recently folded but some vintage awning signs have been left in place for now. 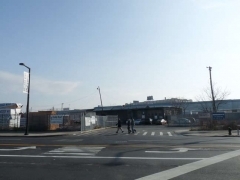 This is one of a number of streets named for its borough, joining Queens Boulevard, Queens Plaza North and South, and Queens Walk in Breezy Point. 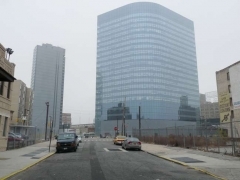 Queens Street is dominated by a huge concrete building on its west side at 43-22. 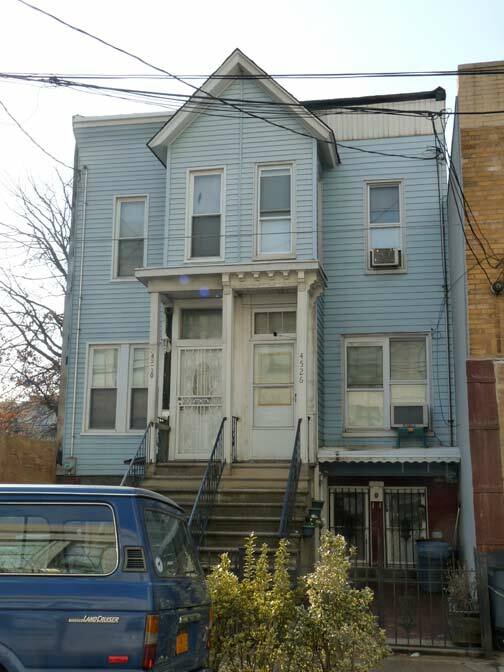 30-30 Thomson Avenue, across Sunnyside Yards. This building houses the NYC Department of Design and Construction. 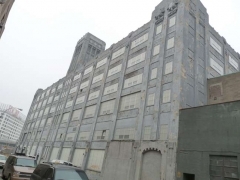 This is a former Chiclets factory and used to have a huge sign on the front showing a Chiclets box with two pieces of candy falling out of it. 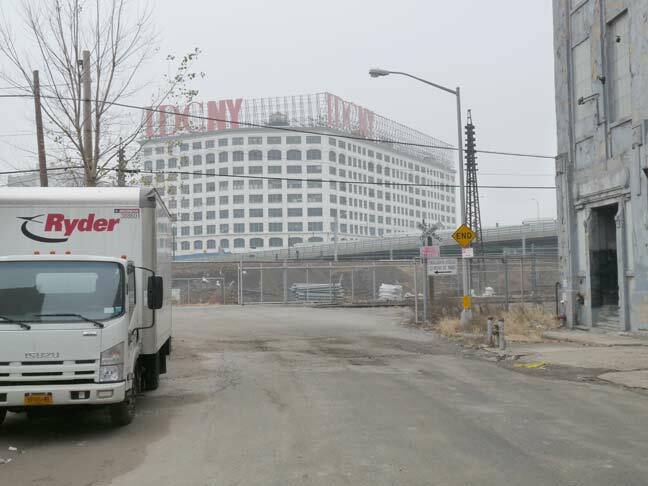 Businesses along Sunnyside Yards would have large signs to attract the attention of riders going by in LIRR trains. Remember the flashing Swingline Staples sign? Former Eagle Electric ad on 43-22 Queens Street. 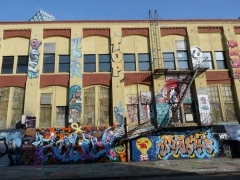 As of 2014, the building has been scheduled to be converted to 780 luxury loft apartments (see Curbed link above). 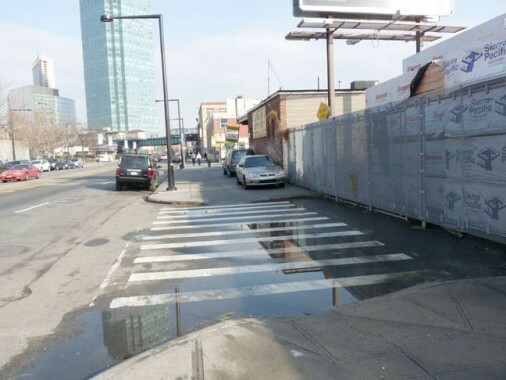 Queens Street isn’t technically a dead end, as there is a vehicular entrance to the Sunnyside Yards at its south end. 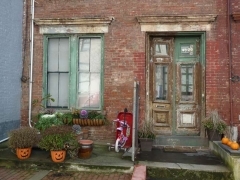 There is also a mysterious 2-story brick building on Queens Street with metal gates on the ground floor and barred windows on the second floor. What’s inside, leftovers from the Federal Reserve? 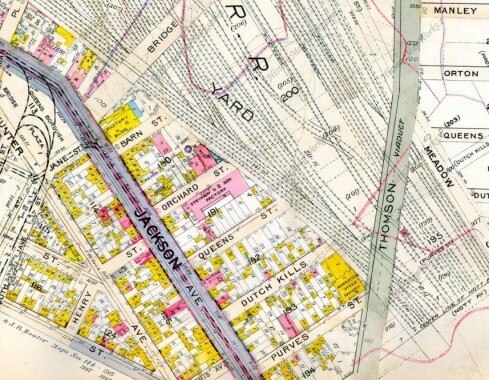 On the 1916 map shown above, the lengthy building on the west side of Orchard Street is marked as a Steinway & Sons factory, so it’s likely that pianos were once built here. 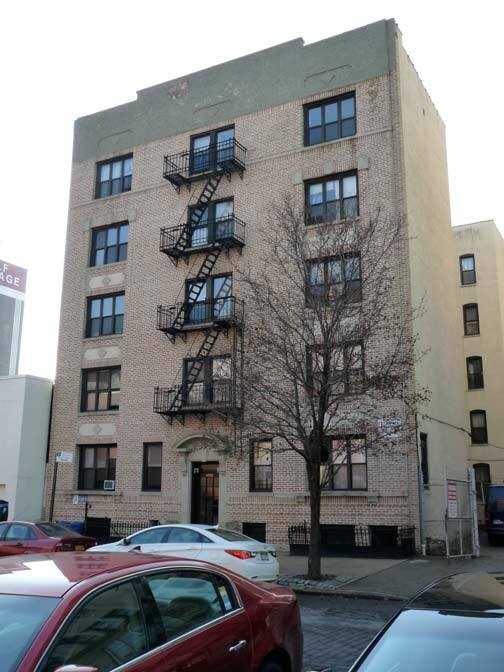 One of the more instriguing buildings on Orchard Street is marked “Office of Rosenwasser Brothers.” I found a couple of articles in the NYTimes from 1918 identifying the Rosenwassers as manufacturers of military ordinanace such as gas mask bags, army leggings, shoes and aviators’ coats. A view north on Orchard Street reveals the new 21-story Gotham Center on Queens Plaza, completed in 2010. The main tenant is the NYC Department of Health. Gotham Center replaced what was likely the ugliest building in Queens other than the legions of Fedders Specials, a municipal parking garage from the Super 70s. 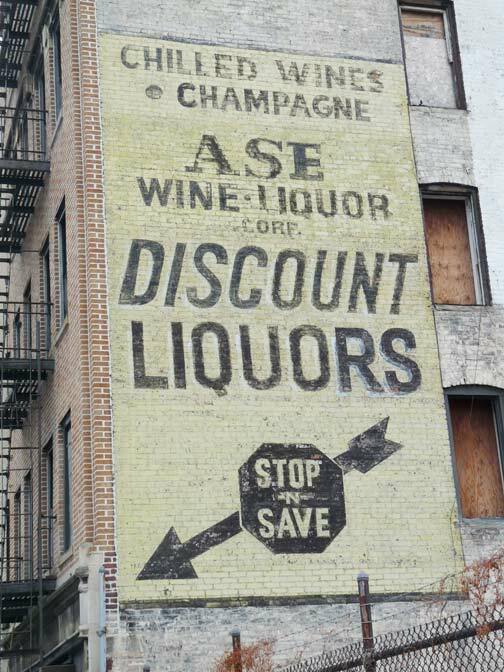 This grand old painted liquor store ad has long outsurvived its patron on Jackson Avenue between Orchard and West Streets. 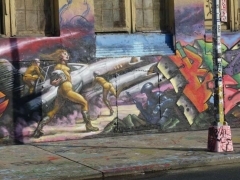 It must have been done with high-quality paint, as the sun beats on it for hours every day when it’s out. The yellow color has faded just a bit since I’ve known about it. This is the northernmost of the “Jackson Holes” and the most mysterious, since it is blocked off by a locked fence and a guard. 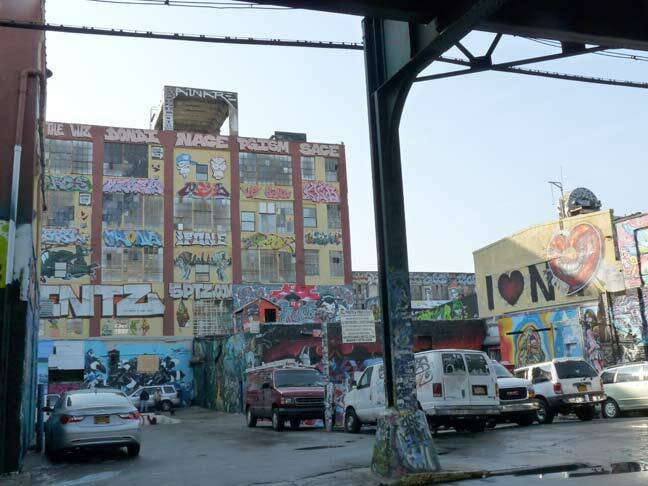 Nevertheless, I do know about one of the buildings on it, the one closest to Sunnyside Yards. 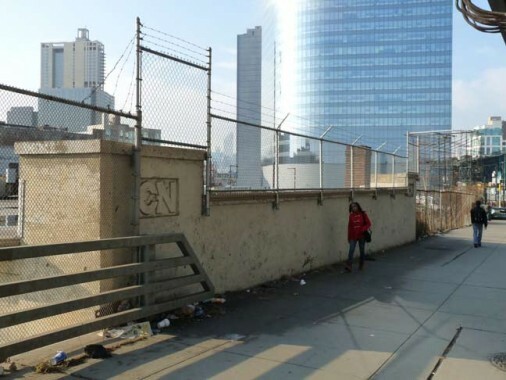 The building in question, as well as a pedestrian bridge on Queens Boulevard, are marked with the initials CN. A five-story poured concrete structure -marked by a siding entering the building – housed the manufacturing plant known variously as “CN Building”, “West Chemical Products”, or “West Disinfectants”. [featuring] an arched roof parapet on its east side with a truncated corner. An angled structure, likely containing a conveyor belt connects the building from its left side to a brick/poured concrete three-story building sporting a CN logo in relief. 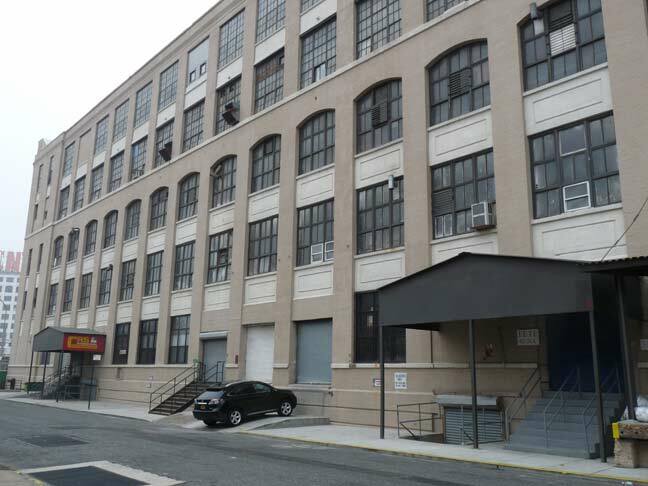 The former CN plant at one time hosted the Dept of Elections Queens Bureau and this is where all the voting machines for Queens were stored. If you needed to change your voters’ registration or get an absentee ballot, this is where you had to come and endure not only the bureaucracy but the stench of the former tenant. 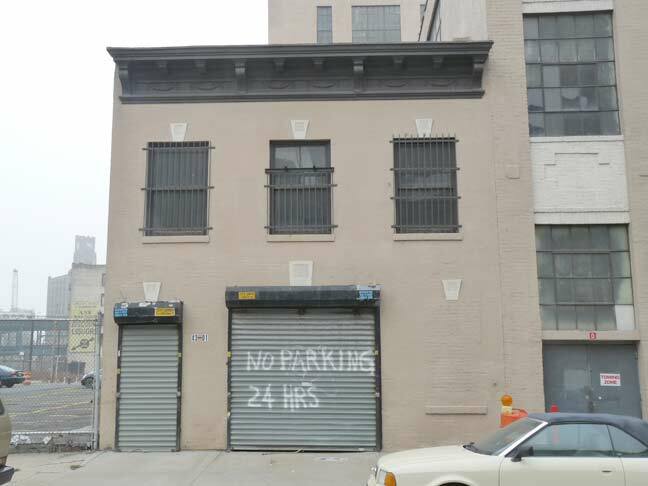 A building facing one of the tracks in Sunnyside yard, visible from Queens Blvd., reveals a long-stopped clock face surrounded by the words “Cleaning Time.” I blew it up big so you can easily read it. 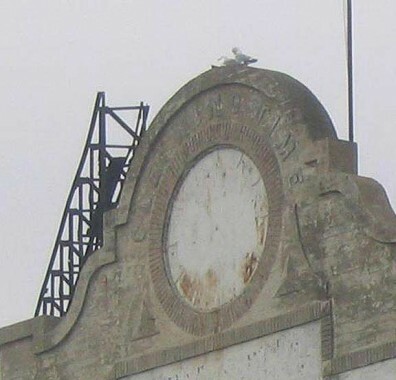 Likely one of the factories here made cleaning products, with the loading dock here, in the back of the building, and the clock was there for pedestrians on the bridge. Possibly, “Cleaning Time” was the slogan of CN at one time. 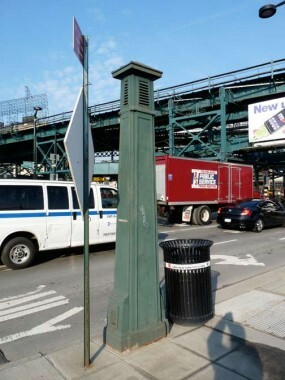 An older street vent (it resembles a Wildebeest) and a flock of highway signs mark the eastern end of Jackson Avenue — east of here it becomes Northern Boulevard. The tangle of overhead metal marks Queensboro Plaza, where BMT and IRT els meet, one bound for Flushing, the other to Astoria. 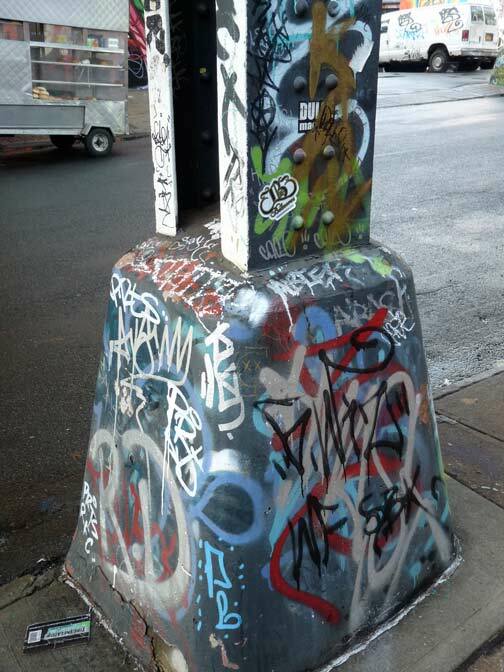 Someone in the NYC Dept. of Design and Construction thought it’d be nifty to mash up some broken sidewalks and stand them on end here. 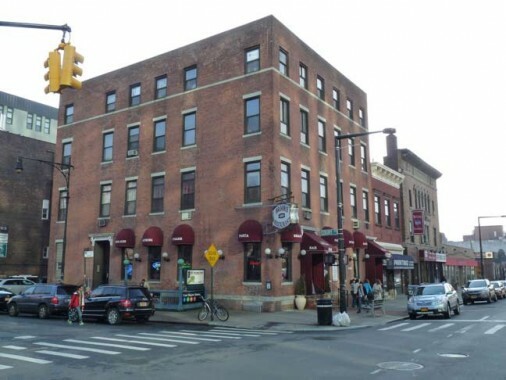 Who are the people that live in Jackson Heights ? Before you ban this post, you have a Happy New Year. Really do enjoy your site. It gets better each year. 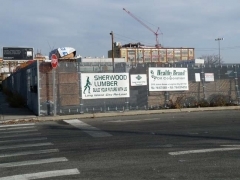 Very interesting, as a former resident of Ravenswood, & who worked throughout LIC & Astoria for many years. The building on Queens St. was indeed an Eagle Electric Plant, but it had no relation, at least in my time, to 30-30 Thompson Ave. That building i recall was the company that made Adams & Dentyne gum. The building on Orchard St I don’t remember as a Steinway building but a company who made ballpoint pens; their name escapes me. 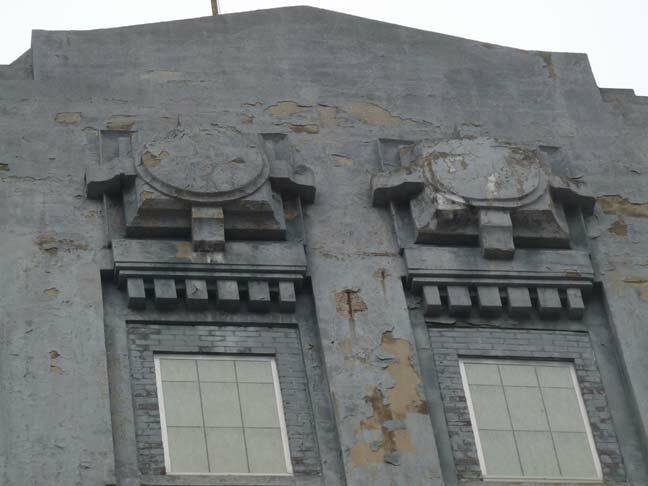 The old West Chemical building at one time was used by the city, in what capacity i can’t remember. Maybe that has something to do with the gates. 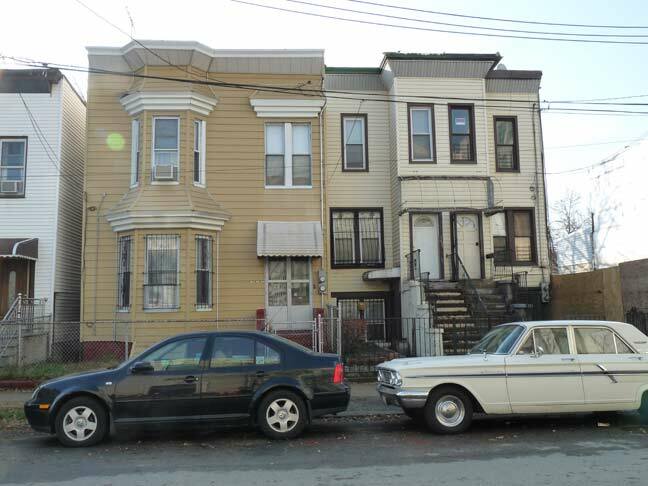 BTW, Eagle also had 2 large plants on both sides of 24th St. just south of Br.Plaza South, along with another one on 21st St. & 24th ave in Astoria. It was once a huge operation, going around the clock at times. One other thing; I believe that is 51st Ave you are looking at the Empire St. Bldg from. 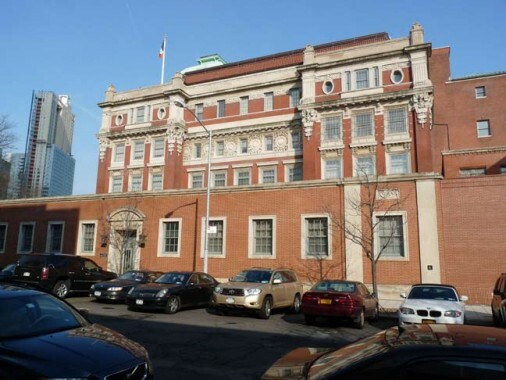 50th has the 108th Pct. on it & runs east. The former Adams Gum/chicklets factory houses the Dept of Design and Construction (known among City Contractors as “Dazed, Dumb and Confused” and the NYC Schools Construction Authority (known among Consultants as “Seriously Confused As***les”. 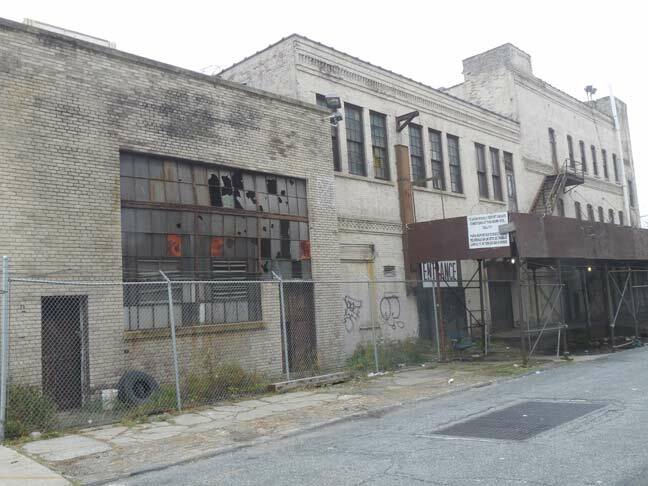 The former CN plant at one time hosted the Dept of elections Queens Bureau and this is where all the Voting Machines for Queens were stored. If you needed to change your Voters Registration or get an Absentee Ballot, this is where you had to come and endure not only the bureacracy but the stench of the former tenant. 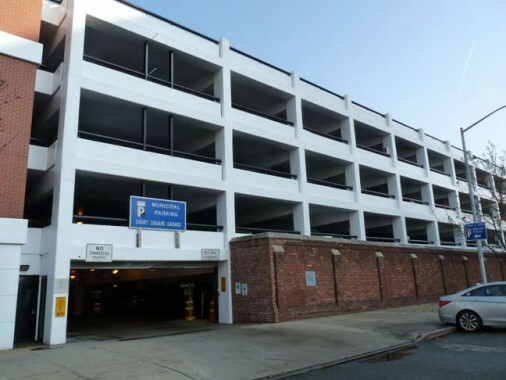 The Parking Garage behind the Courthouse is where the old Queens House of Detention was located, the old brick at the entrance is part of the oiginal structure. A nice Cinema reference to this building, the courthouse, the Lawyers building across the street and the Court Sq elevated station can be found in Alfred Hitchcocks “The Wrong Man” starring Henry Fonda as a musician accused of murder. 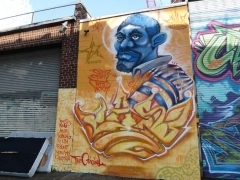 All of the scenes of his arrest, court Arraingment and Incarceration, plus his meetings with his Lawyer and background plate footage were shot in the area between 23/Ely and the Courthouse. There weren’t many, other than too much capitalization. CN (that’s simply what it was called) was a type of disinfectant cleaning product that pre-dated things like Lysol and Mr. Clean. My mom used it a lot to clean the bathroom and kitchen floors, as well as pouring some into the toilet bowl to disinfect it. It was concentrated, and you poured some into a bucket of water to create a solution that would both clean and disinfect. 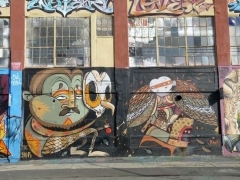 If I remember correctly (c’mon old timers – help me out here! ), it came in a bottle with an orange label, and was dark brown (like iodine) in color. Smelled very strong. I believe there was a clock printed on the bottle cap that had all the hours of the day, but no hands pointing to any specific time. Around the clock were the words that said something like “Any Time Is Cleaning Time” (which would explain the lack of hands on the clock). 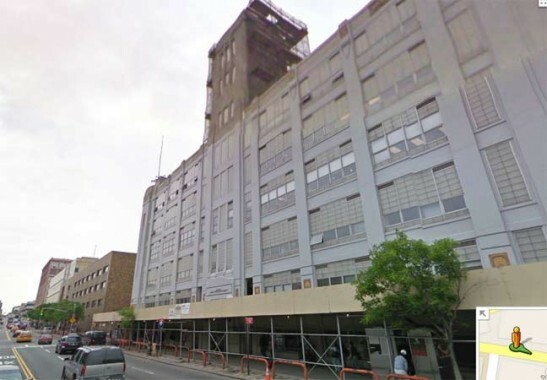 The solution was manufactured and produced in the CN building, and anyone who worked near it always complained about the strong chemical odor that emanated from the building. This was in marked contrast to three other lovelier smells that came from buildings not too far away: the smell of baking cookies from the Sunshine Biscuit Plant (where my dad worked for many years on the loading docks), the smell of gum from the Chickle Building (“Chicklets” Chewing Gum), and the smell of bread baking at the Silvercup Bakeries along the riverfront. Kevin, you are a shadow of your former self in the Wildebeest shot. Interesting stuff as usual. Unfortunately, I’m bigger than I’d like to be. 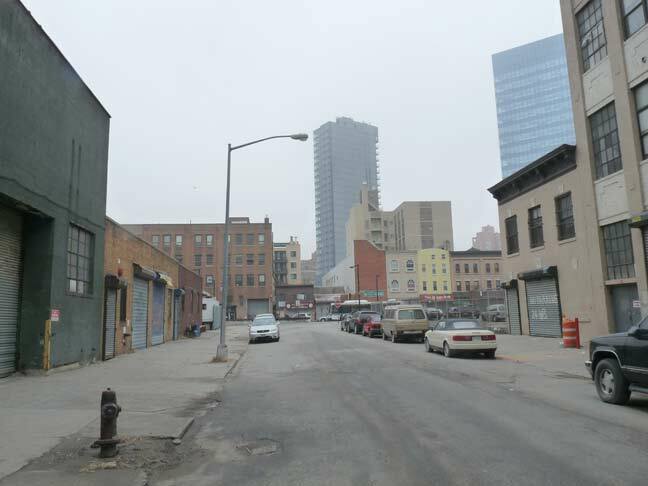 On the south side of the Sunnyside Yards, Davis and Pearson continue, but Anable (Court Square) continues as Austel Place. Great page, love it…! I’ve been looking at old photos of the York College neighborhood in Jamaica lately, especially Union Hall Street. Was there any connection between this street and Union College, which you have referred to a number of times? Please direct me to more info about Union College, if you will. And have a Happy New Year…! I believe Union Hall was a private school that once existed in Jamaica, so nope, no relation to labor unions either. 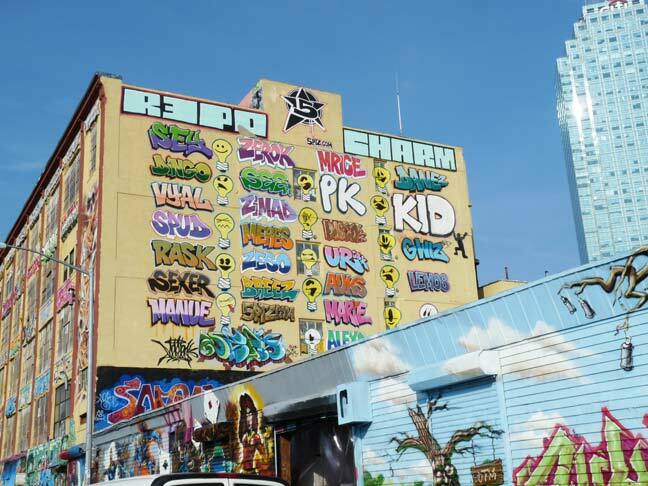 It would have been nice if the 5 Pointz Building was saved rather than have to be demolished, because I like how artistic it looks with all those designs on it. 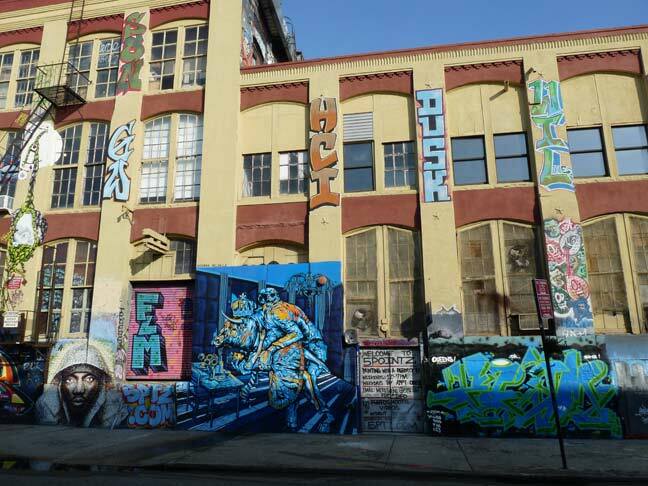 My mom worked for a time in that graffiti covered building on Crane St back in the 70’s for Recoton Corp when they had some sort of operation there. I think she was packaging replacement phonograph needles. 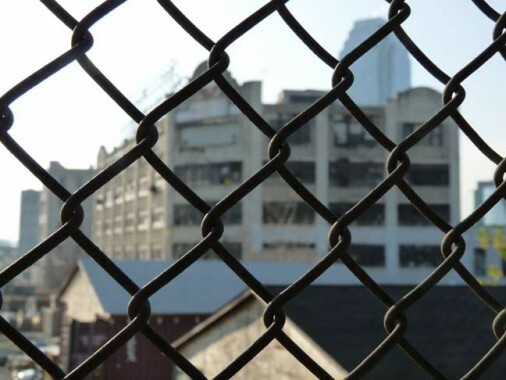 I’m sure that work is done in China now, along with much of the other light and medium manufacturing work that used to be done in LIC and elsewhere in NYC. I once took a taxi from Ridgewood to Astoria and the driver took me a very different way than what I was used to. 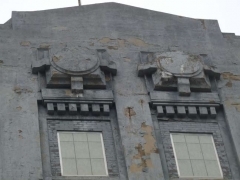 I recall seeing a large greyish concrete building like the one you show on Queen Street. 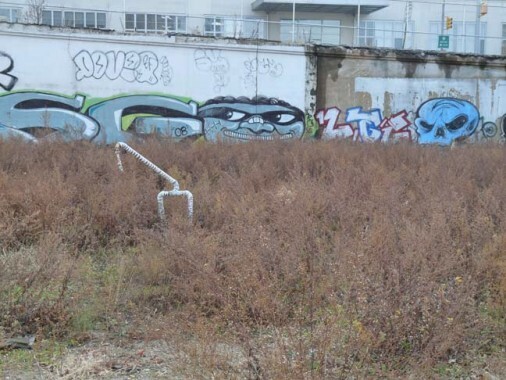 To the side of the building was a large fenced are with probably 5 or 6 old fighter planes in fairly bad shape. Have you ever seen this or know anything about this? 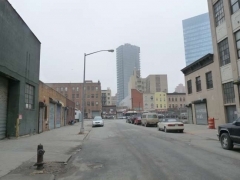 I recall there being a big weekend flea market in the low buildings shown in the photo captioned “the northernmost of the “Jackson Holes”.